The view across Mulranny Golf Club to the fifth green. Millions of gallons of seawater and tons of rock have been dumped on the nine-hole course in Co Mayo. Mulranny Golf Club as it is meant to be seen. Little Mulranny Golf Club, the tiny nine-hole links some 20 miles from Westport in County Mayo, was ravaged by storms at the weekend and half the course lies under water and rock. A combination of a high tide and high winds, saw the ocean break through the coastal defences that had been smashed by the early January storms. Famed for its undulating greens — each of them fenced off by barbed wire to keep the cattle, sheep, horses and donkeys that roam the commonage from destroying them — the club's 200 members fear the next storm will wipe them off the map for good. "It's a real disaster," says the club's Handicap Secretary Fergus Rothwell. "This is the second time this has happened in the space of a month and we are living in fear that the next storm could be the last storm for Mulranny. "The third green and half the third fairway are completely underwater. The water was over the flag and it is now three inches under the flag material. The fifth fairway is completely underwater. The sixth green is under stone. The seventh tee box to the fourth green has a couple of hundred tons of rock on it. It's in a right mess. "We are hanging on to the edge of a cliff by our fingernails, hoping to God that someone, somewhere, will give us a little hand up. We need to get the sea defences back up or the sea will take it." Mulranny was once an 18 hole course before the sea took nine holes. Now it appears that if urgent action is not taken - and unless Mother Nature relents for a while - the course may disappear under water forever. It could cost as much as €100,000 to protect the course from future storms, but given the current economic climate at the priorities of Mayo County Council in more vital, storm-damaged areas, the future looks bleak. "A month ago we got hammered by the storm because it was the perfect storm in terms of the high tide and the wind direction," Mr Rothwell explained. "Back in 1991 we got flooded and the club invested a lot in sea defences but they were annihilated by that first storm a month ago. Boulders as big as cars were dumped on the fairways and tons of water. "We had just about got the course playable again because we had big pumps going for 10 days. But on Saturday morning, a high tide came with a south westerly wind and the same thing happened again. "There is four feet of water on the third green - a month ago the pin was still in the green and it was completely submerged, so that was six and a half feet of water on the third green. "Back in 1991, the club spent IR£30,000 on sea defences and the council put in IR£10,000 and gave the use of their machinery to put in the cages. But the damage to the coastline is worse now and the area needing reinforcement is much bigger. "The big clubs find it easier to get help and attention but we have just 150 male members, 50 female members and a handful of country members. Membership costs just €280, we didn't raise the subs, in an effort to try and hold on to our members." While the course is set on common land [commonge] which the golfers share with donkeys, cattle, sheep and horses, it is still immensely popular with visitors, who must make sure they close the gates that give access to the protected greens. "The members do a lot of voluntary work and on the Saturday after the first storm we had eight to 10 people out all week cleaning up but it is really going to be hard to get people back out again after this," Mr Rothwell added. "I am sure they are fed up with it at this stage with no golf being played. "Ironically, I had just updated the club website to say it is one of the driest courses in Connacht at this time of the year because we run an open weekend and it has been quite successful. Two days later it was the wettest course in Connacht. "When we are going to open again, I just don't know. All the pumps from Galway to Limerick are unavailable because of the flooding there has been. "So we have had to hire a pump in Carrick-on-Shannon and a member will go up and bring that down on Wednesday. "It's a disaster to be honest. There is no finance coming in and people are waiting to see what is going to happen and they are not paying their membership and if it goes on any longer, they could just switch to another club. "During the last storm we had to have a digger there for seven days to move all the big rocks that were scattered over the course - our sea defences - and that was around €350 a day before VAT. "There was thousands of tons of stones that had been fired 100 yards onto the course. Members gathered them into piles and a machine then came to collect the piles. "We would be down at the bottom of the list as regards help from the County Council give all the other things that would be a priority. But we need coastal protection put in or it will go back to nature. "If we don't pump this water out, it will just become a tidal swamp. We would lose the third, the fifth, the sixth and the seventh. Basically, we would have no course. "We will try to open in a few weeks but we will only be able to open about seven holes just to try and get something going for the members. "The rocks that were free for coastal protection now cost money because there is a demand for them. We'd need €100,000 to reinforce 800 yards of coastline and put in proper protection. "Our protection is gone now, the dunes are gone and all the pampas grass that we planted is gone and the cages we put in have been stripped bare." American author Tom Coyne, whose book A Course Called Ireland" chronicled his attempt to walk the entire coast line of Ireland and play every course in his path, wrote in glowing terms of Mulranny Golf Club when he penned a piece [Protecting the Pin in County Mayo] for Golf.com during his trip. "A worth-the-trip throwback to the way golf was originally played, on pastures shared with one's herd, where that first ruling was made and the first relief taken from a steaming livestock left-behind. And there are a few such deposits to be negotiated around the Mulranny fairways, a small price to pay for grass kept at ideal fairway length by dozens of hungry greenskeepers in fuzzy white coats. The greens are thankfully devoid of any such obstructions, rolling fair and true, nary a hoof print to be found anywhere. See, that's where the fences come in." Fortunately for the members at Mulranny, local clubs Belmullet (Carne), Castlebar and Ballina have provided playing concessions. If Mother Nature doesn't relent soon, those clubs may be about to acquire 250 new members. 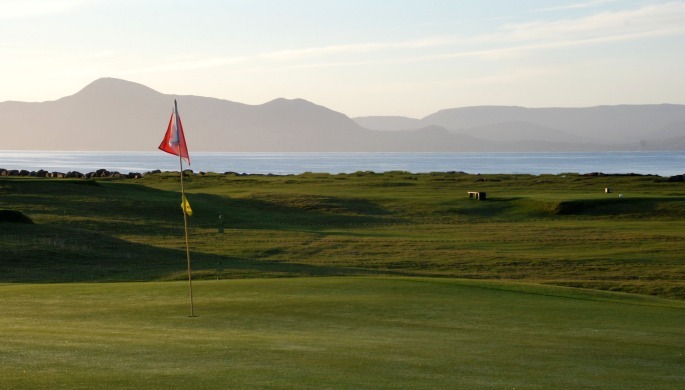 Golf blogger Kevin Markham has also written about his experience at Mulranny. You can read his piece here. 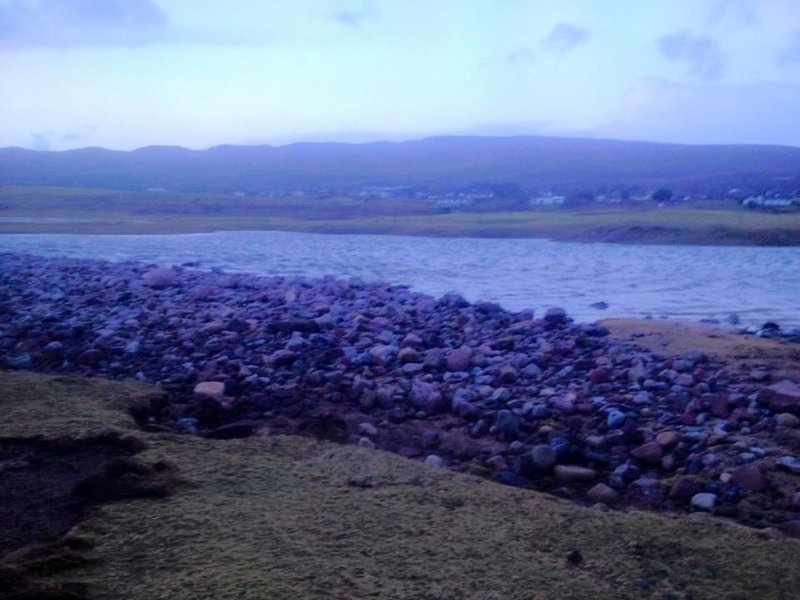 Top golf course designer Tom Doak is aware of the plight of Mulranny Golf Club and its battle to resist the onslaught from the sea. He's even willing to put some of his own hard-earned cash into any potential bid to save the course and even help in the search for backers. Storm-ravaged Mulranny Golf Club is making huge strides in its bid to save the charming nine-hole links from utter destruction.